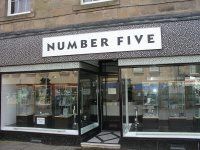 At Number Five, we are proud to offer what is probably the finest and most extensive selection of contemporary jewellery in Scotland. Each jewellery designer and maker is chosen with care and consideration to enhance the renowned reputation of Number Five. We offer a friendly, informal and relaxed atmosphere where customers are welcome to browse the 50 or so makers that are being exhibited in a Gallery style. Each individual maker having their stunning pieces displayed together as a collection and as the way the maker would have intended. Walking around Number Five takes you from clear and cool Stainless Steel and Titanium pieces to the rich warmth of 18ct Yellow Gold sparkling and glinting with Diamonds. Virtually all Jewellery mediums are on display at any one time; from brightly coloured acrylics, anodised Titanium and Aluminium to stunning Silver pieces. Jewellery from: clean cut, delicate, feminine, simple elegance, to chunky and bold designs. Number Five specialises in having a broad and diverse range of individual makers that are constantly developing new designs, all of which are complimented by high quality Jewellery that we source from leading Contemporary Jewellery companies, so that we can offer the best possible range to our discerning customers. Most of the Jewellery Designers and makers are from Scotland and the UK, but we also source other specialist designers and makers form across Europe. Our resident Goldsmith and Designer is Claire Donald who specialises in bespoke commission pieces. Also we have personal relationships with all the makers first hand, and so can approach them to tailor any piece to individual requirements. Whatever the budget, for ladies and gents, whether gift or treat for you - Number Five will have that special piece of jewellery.